Interhalogen Compounds are the subordinates of halogens. Compounds containing two unique sorts of halogens are termed as interhalogen compounds. Example: Chlorine monofluoride, bromine trifluoride, iodine pentafluoride, iodine heptafluoride, etc. Contingent upon the number of atoms in the particle, interhalogens are characterized into four sorts. "X" is bigger (or) less electronegative halogen and "Y" is smaller (or) more electronegative halogen. With the help of radius ratio we can calculate the number of particles in an atom. As the radius proportion expands the number of atoms per molecule likewise increments. So out of all interhalogen compounds Iodine heptafluoride has the highest number of particles per atom as it has most astounding radius proportion. These interhalogen compounds are manufactured by two strategies. By direct mixing of Halogens and by reaction of Halogens with lower Interhalogen compounds. Halogen atoms react specifically to frame interhalogen compound. For Example: Equal volumes of chlorine and fluorine join at 473K to shape chlorine monofluoride. Interhalogen compounds exist in vaporous state, solid state, or fluid state. Most of these compounds are unstable solids (or) fluids at 298K while rest are gasses. For instance chlorine monofluoride exists as a gas while bromine trifluoride and iodine trifluoride exist as solid and liquid state separately. All these compounds are covalent in nature because of less electronegativity distinction between bonded molecules. For Example Chlorine monofluoride, Bromine trifluoride, Iodine heptafluoride are covalent in nature. All these interhalogen compounds are diamagnetic in nature as they have just bond pairs and lone pairs. Interhalogen compounds in comparison to other constituent halogens are more reactive (aside from fluorine). This is on the grounds that A-X bond in interhalogens is weaker than X-X bond in halogens aside from F-F bond. Structures of these diverse sorts of interhalogens are unique in relation to each other which can be clarified utilizing V.S.E.P.R Theory. In chlorine trifluoride, chlorine, the central atom has seven electrons in the valence shell. Three of these will frame three bond pairs with three fluorine molecules leaving four electrons. According to V.S.E.P.R hypothesis these will involve the corners of trigonal bipyramid. The lone pairs will involve the tropical positions while bond pairs will possess the other three positions. The axial bond pairs bend towards the tropical position to minimize the repulsions due to lone pair- lone pair bonds. Thus its shape is bowed T-shape. 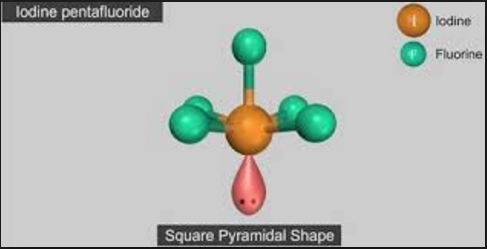 The central atom in Iodine pentafluoride has one lone pair and five bond pairs which is why its shape is square pyramidal. 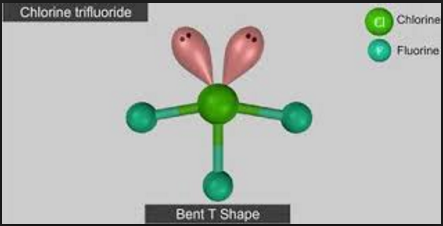 The central atom in Iodine heptafluoride has seven bond pairs which is why the shape is pentagonal bipyramidal shape. These are utilized as non-watery solvents. They are utilized as a catalyst in couple of reactions. UF6 which is used in the enrichment of 235 U is produced by using ClF3 and BrF3. These are utilized as fluorinating compounds. Q1. How are interhalogen compounds formed? Sol. The halogens react with each other to outline interhalogen compounds. The general condition of most interhalogen compounds is XYn, where n = 1, 3, 5 or 7, and X is the less electronegative of the two halogens. The compounds that are encircled by the union of two halogens are named as Inter Halogen Compounds. Q2. Why interhalogens are more reactive than halogens? Sol. The interhalogens are for the most part more reactive than halogens aside from F. This is on the grounds that A-X bonds in interhalogens are weaker than the X-X bonds in dihalogen particles. Reaction of inter halogens are same as halogens. Hydrolysis of interhalogen compounds give oxy acid and halogen acid. Q3. Can Fluorine be a central atom? Sol. Fluorine cannot be the central particle in inter-halogen compounds since it is an element from the period 2 in the periodic table. It can't have more than 8 valence electrons. What's more, as it has 7 valence electrons, it can just frame one bond. Q4. Why is it impossible for hydrogen to be the central atom? Sol. This is on the grounds that an atom will dependably attempt and get to the condition of most minimal energy, for Hydrogen this implies either 2 electrons thusly finishing its 1s sub shell or 0 electrons. This implies it can just ever frame one bond, and in the event that it had more electrons it is most likely too small to fit other molecules present around it.